Vietnam exported wood and timber products worth 1.48 billion USD to 38 markets in the first two months of 2018, a year-on-year rise of 38.3 percent. Growth was reported in most markets, including the US (29 percent), China (29.6 percent), Japan (34.5 percent) and the Republic of Korea (48 percent). Strong hikes were recorded in Switzerland (508 percent), Finland (486.5 percent), Turkey (187.6 percent), Saudi Arabia (187.4 percent), Malaysia (138 percent) and the Czech Republic (104.8 percent). Chairman of the Handicraft and Wood Industry Association of Ho Chi Minh City (HAWA) Nguyen Quoc Khanh advised wood companies to pay more attention to international standards to reach out further to the world. 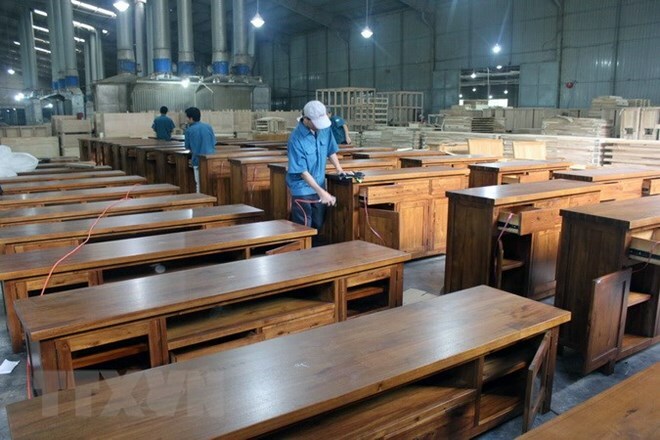 He noted that since major global wood producers are shifting to other industries, it would not be difficult for the Vietnamese wood sector to increase its market share in the global market. Vietnam hopes to enjoy wood export growth of 13 percent in 2018, 13.7 percent in 2019 and 14.5 percent in 2020, he added. To realise these goals, wood firms should invest in technology to reduce production costs and increase quality of products and their added value, Khanh recommended. I am concerned about the increase in wood and wood products exports. Why should the US, China, Japan, Korea, and a bunch of other countries need wood from Vietnam? What kinds of wood is VN exporting? We have serious problems with illegal deforestation and logging. There is report about illegal logs from nature reserves in Kampuchea have found illegal ways into Vietnam. Increase wood export may exacerbate all these problems. And why are major global wood producers [in other countries] shifting to other industries? Do they stay away from wood because of environmental protection policies? If they are out, why should we want to be in, other than making some quick bucks regardless of our environmental problems? Friends, let’s pay attention to this issue and do some studies on it.